Sports Handicapping Monitor: Buy or sell documented sports handicapping picks from monitored online sports handicappers. Sports sharing platform and sports handicapping monitor for online sports handicappers. Get the best game day picks from proven documented handicappers. If you're interested only in the top picks released by the Documented Handicappers rated 4 or 5 units, than the Big Pick Alert plays are your choice. Our Big Pick Alert plays are our premium picks that come with a credit back guarantee! 100% monitored sports handicapping services. Buy or Sell your sports advice to the community. A new concept in sports handicapping monitors. The documented handicappers exchange platform allows online sports handicappers the ability to buy or sell their sports research. All records are monitored and all sports handicapping picks are released after the start of each game. Team up with the sports betting top handicappers and join the top online sports handicapping monitor today for your winning picks this season. Purchase member picks or earn commission from selling your sports advice to other DH community members. View Profile and Available Picks for Mike Ryan Mike Ryan is 33-8 (80%), + $8,085 over the last week. 7 picks today. View Profile and Available Picks for Jack Jeffries Jack Jeffries is 28-13 (68%), + $3,589 over the last week. 7 picks today. View Profile and Available Picks for Donny Pearson Donny Pearson is 14-2 (88%), + $3,000 over the last week. 3 picks today. 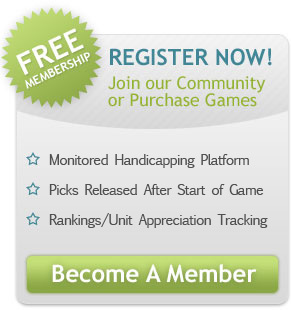 Join the best sports handicapping monitor online today. NFL Football, College Football, Baseball, and Basketball sports handicapping and a new way of monitoring sports handicappers.